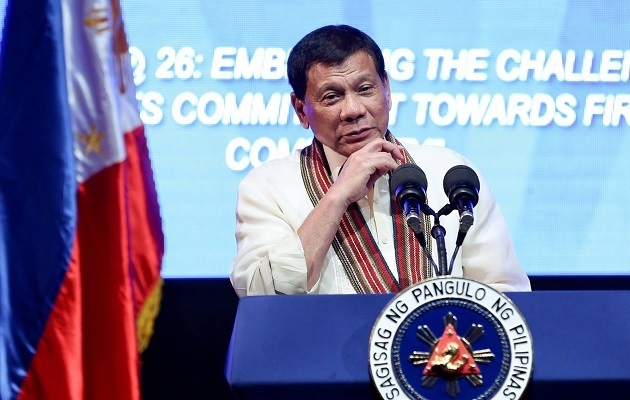 The President of the Philippines, Rodrigo Duterte, has begun a dialectical war against Christianity in his country more than simply against God. It is a curious case of disagreement with the electorate, if we take into account that 91% of the population in the Philippine islands declares itself Christian, the vast majority of them Catholic. Recently, Duterte publicly asked, “who is this stupid God?”, afterwards assuring that “he creates something perfect, and then he thinks of an event that would destroy the quality of his work”, then asked again at the end, “how can you rationalise a God like that?”. In addition, the Philippine President has also expressed outrage at the idea of original sin. “Now we are all born with original sin. You’re still in the womb and even then you have sinned”, he said. “What kind of religion is that?”. The statements have provoked a wave of responses across the country. The most talked about, and the majority of responses, have been from Catholic representatives, such as Bishop Arturo Bastes, who has called his parishioners to pray that the “blasphemous statements (of Duterte) and his dictatorial tendencies come to an end”. However, far from settling the debate, the Philippine President added that “if there is any one of you, the noisy ones, that say you’ve been up to heaven, talked to God, seen him personally, and say that he exists, I will step down from the presidency tonight. I just need one witness who will say, ‘those fools in the Church ordered me to go to heaven and talk to God, and he really exists. We have a photo together and I brought a selfie I took with him’”. According to the Joshua Project, little more than 12% of the population claims to be Evangelical Christian. Different entities that represent this group of Filipinos have avoided following on the tone of the President’s statements, although they have published statements lamenting the attitude of their political leader. “Using one’s own prerogatives and privileges to attack another’s faith, beliefs and traditions is not only discriminatory and disrespectful, it is also a brazen exercise of power against one’s own religion. We urge the President, as head of state, to respect the declarations of faith of other churches”, the National Council of Churches in the Philippines (NCCP) said. The organisation, which declares itself an ecumenical community of Protestant and non-Roman Catholic churches, added, “may God enlighten our leaders, especially our President, and all those in civil authority. May God continue to grant them the grace of discernment in all conversations”. Those most affected are seen from the Philippine Council of Evangelical Churches (PCEC), who have remarked that they feel “immensely offended by President Rodrigo Duterte’s statement that God and the Biblical teachings of creation are stupid”. The institution considers it “completely inappropriate that the President of our nation disdainfully insulted the God of the Christian faith, who is not only deeply revered by the majority of Filipinos, but also a great many people around the world”. “The Preamble to the 1987 Constitution even recognises the faith of the Filipino people in the help of Almighty God”, it says. “Our objection to the religious insult of President Duterte also stems from the democratic principles of our country. Therefore, we denounce the insult to religion of another person which, sadly, the President has demonstrated on several occasions”, the PCEC states. In this regard, they implore Duterte “to refrain from issuing insulting statements against the Christian faith”, to “keep up a dialogue with the leaders of the different Christian traditions in the country”, and to lead “the promotion of respect for different religious beliefs”, pointing out how dangerous these sorts of declarations can be for peace. “History shows us that religious intolerance can lead to animosity and violent conflict”. Members of the council are invited to “pray fervently for President Duterte and his administration”. Since before his arrival to power in 2016, Rodrigo Duterte already had a strong link to violence in the Philippines. Accused of organising ‘death squads’ whilst he was the mayor of Davao and ending the lives of people with drug addiction and street sellers of hallucinogens, the Chief Executive has pulled the Philippines out of the International Criminal Court after the institution opened an investigation into the war on drugs that triggered an increase in violence that began in the country after Duterte became President. According to the organisation Human Rights Watch, Duterte’s anti-drug policy has already left 12,000 dead in the Philippines, “mainly poor city dwellers, including children”, says the agency’s 2018 report. The organisation also reports that the Philippine President, whose term ends in 2022, has participated in the “harassment and intimidation of people and agencies responsible for accountability, including United Nations officials” throughout 2017. Humans Rights Watch also states that “the violation of children’s rights, attacks on journalists and the media, and the government’s political failures that have contributed to the worsening of the country’s HIV epidemic, all prevailed during 2017”. The United Nations Office on Drugs and Crime (UNODC) has also expressed its concern over “reports of extrajudicial executions of drug-dealing suspects in the Philippines”.